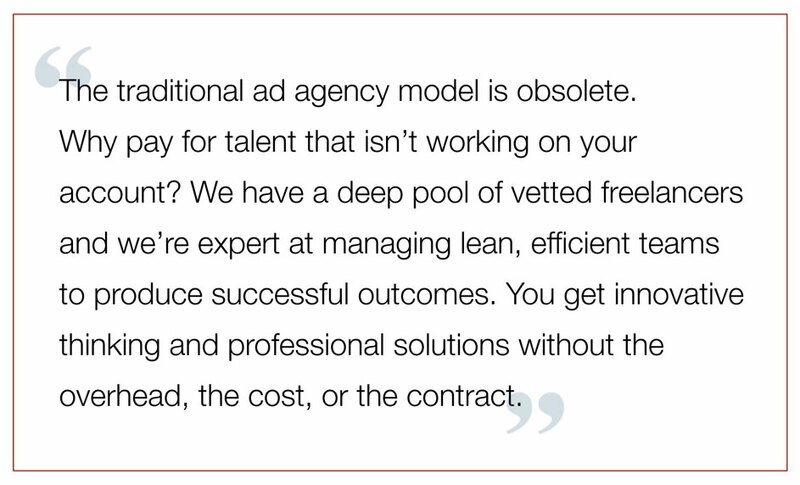 An affordable digital agency doesn’t have to be a fairy tale. Still River Creative offers a full range of professional services. Our lean, efficient operating style is driven by the insight and experience of a seasoned core team that can scale up rapidly. For the simplest, most succinct description of our business model, read our 20-second elevator pitch. Not $$$. Not ¢. Just solid expertise that won't break the bank. Whether you need an on-call creative partner who understands your marketing strategy or a versatile production group that can handle any type of project, SRC is a full-service resource. Questions? Contact us via any page-top link. Seeking fertile minds to breathe new life into your website? Creating your first-ever site? How you plan and how you build are crucial. These early-stage choices will influence virtually every decision and action that follows, for the life of your project. A cohesive brand image that resonates with and empowers your target audience is at the heart of every great design. With our team supporting your marketing, professional branding/rebranding, award-winning design, first-class production, and deep industry experience are at your fingertips. A strong online presence is possibly the most cost-effective strategy in your marketing mix. With the company website generating good traffic and your organization benefitting from a well-defined brand image, your online activity becomes a powerful force multiplier you can deploy at low cost. Understand the dynamics of social media and its tools. We recommend a written strategy, even an informal one, that spells out your plan and evolves into a style guide that ensures a consistent voice across all channels. Retain a skilled content manager who can source and curate content that empowers your target audience. When implemented with discipline, the resulting favorable response and community reputation can take your online presence to the next level. Never underestimate the impact a professional copywriter can have on marketing. Still River Creative was founded by an ad agency copywriter with 25 years of experience. Our CopyJocks division was created to help clients develop and manage their written content. Click or tap anywhere in this box to learn more. "Expect to have your sales efforts transformed by expert messaging that compels your target audience to act." Charles Moore is an award-winning copywriter and creative director with deep experience in high tech, consumer, and catalog marketing. During 28-plus years in marketing/advertising he expanded his professional expertise to include account management, graphic design/web design, and front-end development. He keeps his skills honed through direct involvement with multiple projects and brings the seasoned perspective of a multi-discipline creative leader. Prior to founding Still River Creative in 2008, Charles helped develop memorable solutions for clients that included Geerlings & Wade, Hudson National Bank, Houghton Mifflin, NEC, Digital, and Wang. As a freelance copywriter and creative consultant he has worked for a variety of ad agencies and design firms including Webb & Company/Potpourri Group; Weber Temple Magruder; Harper, Bellotti & Co.; Emerson Bearfield; M-R Associates; Clockwork Design Group; 3D Solutions; and Carol McLeod Design LLC. Joe Durand is an accomplished creative director, designer, and educator with 25-plus years of experience in a wide range of professional settings. Working as a leader in highly competitive and collaborative digital and print environments, he's assumed responsibility for all facets of the creative design process from vision and inception to final deliverable. Before opening his own design business, Joe held high-level positions at Gate 3 Design (Creative Director) and Martha Stewart Living/Omnimedia (Production Director). In addition, he has spent more than 20 years teaching at leading media arts colleges in Boston. Joe holds a BFA in Graphic Design from Massachusetts College of Art and Design. His technical proficiencies include Adobe Creative Suite; Balsamiq Mockups; Axure; Microsoft Excel; QuarkXpress with fluency in HTML, CSS and popular design/development applications. Will is fluent in all essential aspects of site development, including SEO, social media integration, website optimization, cross-browser compatibility, mobile support and accessibility, and is quick to learn and apply emerging web design and development trends. He believes passionately in building online experiences that engage visitors and convey information quickly, reliably and memorably. River People are the talented individuals who extend our capabilities beyond those that already exist in house. We maintain close relationships with other web designers and developers, graphic designers, social media and inbound marketing specialists, copywriters, photographers and other digital specialists. All are trusted professionals who share our vision of customer engagement and empowerment, and our do-it-right-the-first-time attitude of accountability. River People are among the reasons we can quickly mobilize an experienced team that's optimized for a particular client or project. If the knowledge or expertise needed in the moment isn't already in house, we can access it quickly and easily.